Today (Monday, November 27), the Supreme Court is hearing a case, Oil States Energy Services, LLC v. Greene’s Energy Group, LLC, that seeks to end a newish procedure called inter partes review (IPR). The arguments in Oil States will likely focus on arcane constitutional principles and crusty precedents from the Privy Council of England; go read the SCOTUSblog overview if that sort of thing interests you. Whatever the arguments, if the Court decides against IPR proceedings, it will be a big win for patent trolls, so it's worth understanding what these proceedings are and how they are changing the patent system. I've testified as an expert witness in some IPR proceedings, so I've had a front row seat for this battle for technology and innovation. A bit of background: the inter partes review was introduced by the "America Invents Act" of 2011, which was the first major update of the US patent system since the dawn of the internet. To understand how it works, you first have to understand some of the existing patent system's perverse incentives. When an inventor brings an idea to a patent attorney, the attorney will draft a set of "claims" describing the invention. The claims are worded as broadly as possible, often using incomprehensable language. If the invention was a clever shelving system for color-coded magazines, the invention might be titled "System and apparatus for optical wavelength keyed information retrieval". This makes it difficult for the patent examiner to find "prior art" that would render the idea unpatentable. The broad language is designed to prevent a copycat from evading the core patent claims via trivial modifications. The examination proceeds like this: The patent examiner typically rejects the broadest claims, citing some prior art. The inventor's attorney then narrows the patent claims to exclude prior art cited by the examiner, and the process repeats itself until the patent office runs out of objections. The inventor ends up with a patent, the attorney runs up the billable hours, and the examiner has whittled the patent down to something reasonable. As technology has become more complicated and the number of patents has increased, this examination process breaks down. Patents with very broad claims slip through, often because the addition of the internet means that prior art was either un-patented or unrecognized because of obsolete terminology. These bad patents are bought up by "non-practicing entities" or "patent trolls" who extort royalty payments from companies unwilling or unable to challenge the patents. The old system for challenging patents didn't allow the challengers to participate in the reexamination. So the patent system needed a better way to correct the inevitable mistakes in patent issuance. 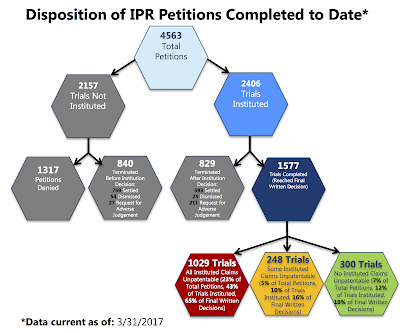 Disposition of IPR Petitions in the first 5 years. From USPTO. 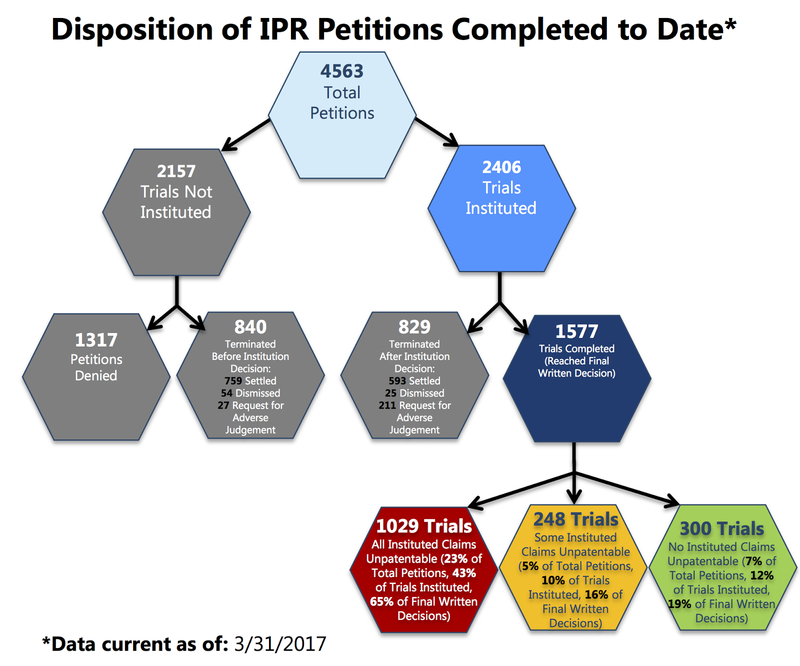 In the 5 years that IPR proceedings have been available, 1,153 patents have been completely invalidated and 287 others have had some claims cancelled. 331 patents that have been challenged have been found to be completely valid. (See this statistical summary.) This is a tiny percentage of patents; it's likely that only the worst patents have been challenged; in the same period, about one and a half million patents have been granted. It was hoped that the IPR process would be more efficient and less costly than the old process; I don't know if this has been true but patent litigation is still very costly. At least in the cases I worked on had correct outcomes. Some companies in the technology space have been using the IPR process to oppose the patent trolls. 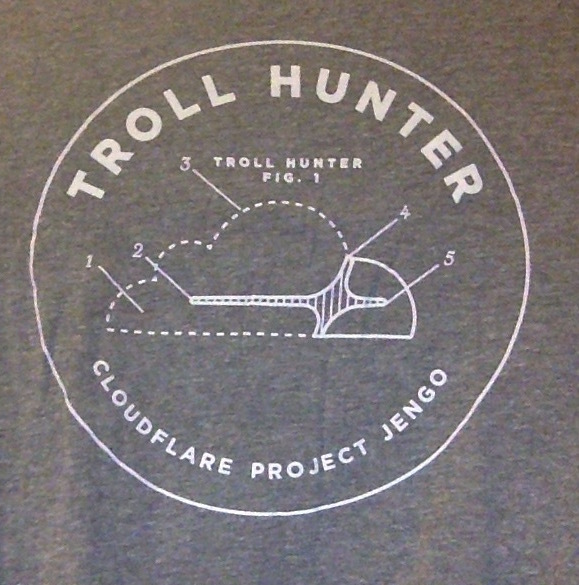 One notable effort has been Cloudflare's Project Jengo. 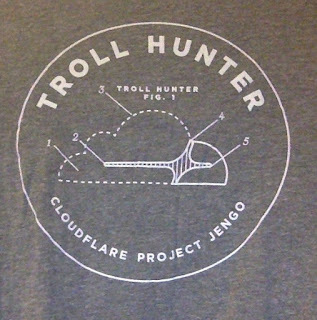 Full disclosure: They sent me a T-shirt! Update (November 28): Read Adam Liptak's news story about the argument at the New York Times. Apparently Justices Gorsuch and Roberts were worried about patent property being taken away by administrative proceedings. This seems odd to me, since in the case of bad patents, the initial grant of a patent amounts to a taking of property away from the public, including companies who rely on prior art to assure their right to use public property. Some news stories are characterizing the IPR process as lopsided against patent owners. (Reuters: "In about 1,800 final decisions up to October, the agency’s patent board canceled all or part of a patent around 80 percent of the time.") Apparently the news media has difficulty with sampling bias - given the expense of an IPR filing, of course only the worst of the worst patents are being challenged; more than 99.9% of patents are untouched by challenges! Update (April 24, 2018): In a 7-2 decision, with Justices Gorsuch and Roberts dissenting, the Supreme Court upheld the constitutionality of inter partes review. The decision is here.